Sales Professionals have a lot on their plates. Times have changed. The traditional “buyer” journey from prospect to deal has vanished. Consumers are becoming more sophisticated. Salespeople have learned to nurture, share and engage with prospects in ways that add value to the relationships. 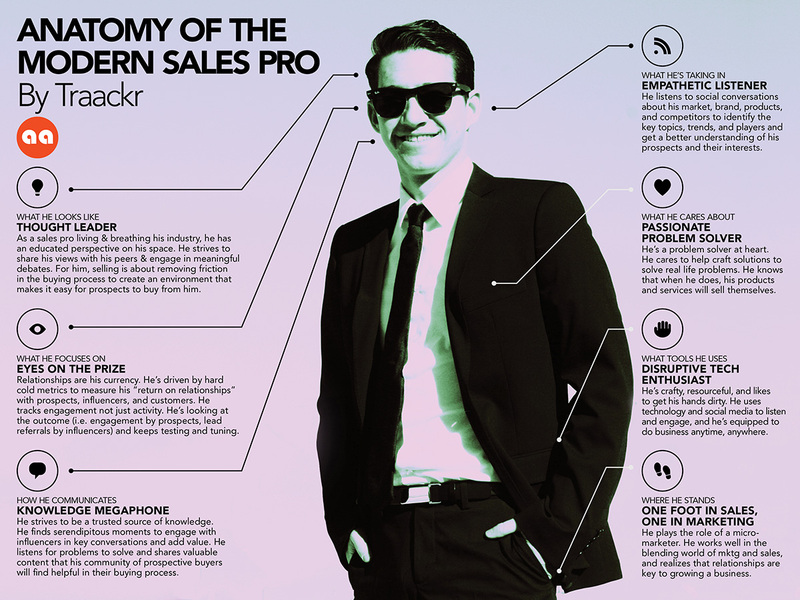 So, what does it take to be a highly evolved Modern Sales Pro? Looking at the social selling strategies of our forward -thinking customers and influencers, we identified these seven key attributes. Modern sales professionals are living and breathing their industry, and they have an educated perspective on their space. They strive to share their views with their peers and engage them in meaningful debates. For them, selling is about removing friction in the buying process to create an environment that makes it easy for prospects to buy from them. While developing meaningful relationships, they don’t lose sight that these relationships are their currency. They are driven by hard cold metrics to measure their “return on relationships” with prospects, influencers, and customers. They track engagement not just activity. They are looking at the outcome (i.e. engagement by prospects and influencers, lead referrals by influencers), and keep testing and tuning. They listen to key influencer conversations across the social web about their market, brand, products, and competitors to identify the key topics, trends, and players that are pushing the conversation forward and get a better understanding of their prospects and customers, their backgrounds and interests. They strive to be a trusted source of knowledge and assert their subject matter expertise. They find serendipitous moments to engage with influencers in key conversations and add value. They listen for problems to solve and share valuable content that their community of prospective buyers will find helpful in their buying process. They are problem solvers at heart. They genuinely care to help their community craft solutions to solve real life problems. They know that when they do, their products and services will sell themselves. They are crafty and resourceful and like to get their hands dirty. They are able to multitask with different tools and understand how they work together. They use combinations of technology and social media to listen and engage, and they are equipped to do business anytime and anywhere. They play the role of a micro-marketer. They work well in the blending world of marketing and sales, and realize that relationships are key to growing a business. We’d love to get your thoughts. What are the skills and experiences necessary to make a great sales exec? The comments are yours.